Quinoa pronounced as "keen-wah" is a seed, not a grain and it’s grown high in the Andes Mountains of South America. It is a species of goosefoot (Chenopodium) .It is packed nutrients including all eight essential amino acids. It is gluten and wheat free too and has the perfect ratio of carbohydrates, proteins, and fats. Quinoa by itself tastes rather bland but it is great when flavoured with spices, herbs, nuts and vegetables. Together with grains, seeds and nuts there are many foods such as fruits and vegetables that are good for a healthy diet and to give you healthy teeth too. Foods like salmon, purple cabbage, ginger, green tea and water are good for healthy teeth .Try and avoid alcohol, sweets, refined carbohydrates, dyes and consume berries and beetroot in moderation as they tend to stain the teeth unless you brush your teeth immediately after eating them. Simply health are promoting "Eating for a healthy smile" I have created this recipe using ingredients that are healthy for your teeth and I am entering this recipe to the Simply health Healthy smile competition. Beautiful and Vibrant layered salad with aromatic flavours and textures. 1. Add the oil in a pan, when it is hot add the onions and sauté for 1 minute.Next add the cabbage,ginger paste salt, chilli powder and lemon juice and toss the cabbage for 5-6 minutes until it softens but is al dente.Remove from heat and cool. 3. Add the quinoa to apan and add the water. Add the salt and turmeric and bring to boil. Once water begins to boil, reduce the heat and cook the Quinoa for 15 minutes until all the water is absorbed and Quinoa is cooked. Transfer the cooked quinoa to a bowl and wait for it to cool. Add the chopped coriander and mix together. 4. Shred the gem lettuce and finely slice the peppers, Mix together and keep aside. Layering the salad. 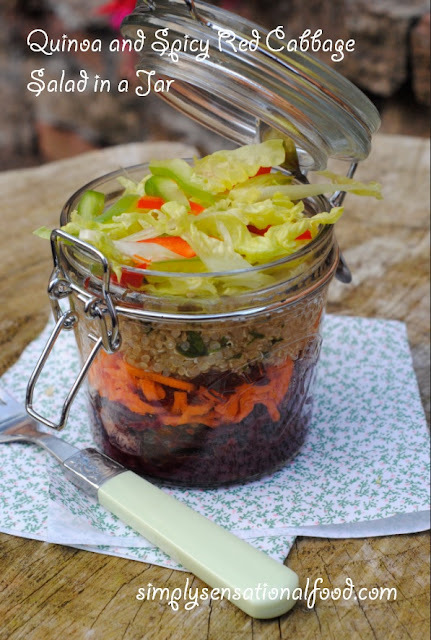 In a kilner jar with a large mouth, add a layer of the spicy cabbage, pack it down. Add a layer of the carrot and cranberry mixture and pack it down. Next add the layer of Quinoa mixture and pack it down. Finally add a layer of the green salad. Looks delicious! I'll have to try it sometime! Beautiful and healthy. Can there be a better combination? Very nice salad with quinoa and red cabbage. looks delicious as always, i like the idea of the jar! Love this! I like salad, so going to try this soon! What a wonderful idea. I love the fact that it is in the jar, it looks amazing! What a lovely pretty layered salad Nayna. Perfect for a work packed lunch! This looks so tasty and perfect for lunch. It looks delicious but you wouldn't eat it from the jar would you? There's no wiggle room to get a bit of everything on your fork. A great one to bookmark for next years picnics though - super portable! I love the idea of the jar. The colours and layers looks so appealing. 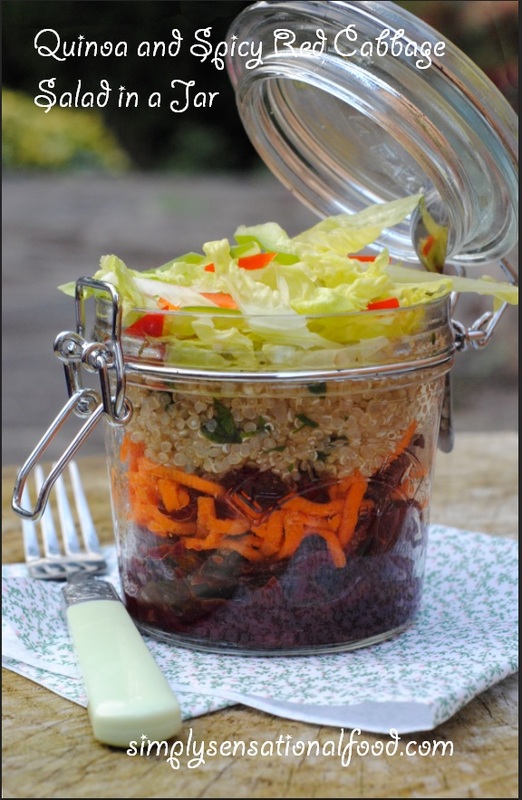 I love the little jar idea, I have never had Quinoa - really must try it! Quinoa is one of those ingredients that I didn't like at first, but having used it a few times over the years now, it's a versatile ingredient. This salad looks delicious! love this to go lunch , i needed this for my two weeks course. comes handy. I love the layered idea very much. Quinoa is a favourite with Miraj at the moment so I will try layering it with the other healthy options you have used. Quinoa is one of my favourite staples and I have it practically every other day with avocado, cucumber and tomatoes. I love your version and what a wonderful way to present the salad. I like the contrast of colours. Bet it tastes lovely. Great idea to take the salad with you. If you put the dressing on the bottle nothing gets soggy before lunchtime either.